Over the last two years we’ve felt very privileged to collaborate with a number of AHSNs (Academic Health Science Networks), and to provide training for them. AHSNs are membership organisations within the NHS in England – they were created in May 2013, with the aim of bringing together health services, and academic and industry members. They’re catalysts, designed to create the right conditions to facilitate change across whole health and social care economies, with a clear focus on improving outcomes for patients. We have really seen how they foster collaborative solutions. 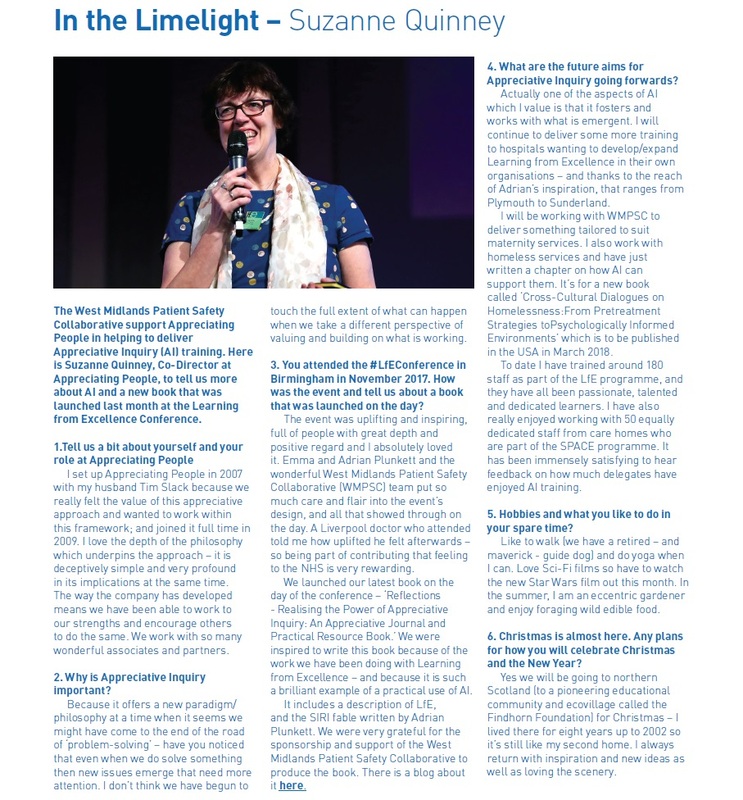 You can read Suzanne’s interview, which was sent out in WMAHSN’s newsletter, about the role of appreciative inquiry, here. With WMAHSN and the founders of LfE, we were proud to win an award. WMAHSN also sponsored our latest publication, Reflections, an appreciative journal and practical resource book. The team at the WMAHSN asked us to provide our training to the PSC within in the South West’s AHSN in September, so we were lucky enough to go and visit the beautiful city of Exeter. We connected with a community of practice in the region, which is active with LfE, and wanted to do more with it… As a result, we’re looking forward to training in Plymouth Hospital next month. AQuA was established in 2010 to improve health and care quality in the North West, working with over 70 member organisations, helping them to build improvement capability at all levels of their workforce. We’ve trained their staff in AI, and run training events and seminars on their behalf – particularly with a focus on supporting patient safety, working together since 2014. Thanks to our work with them, we provided a number of training seminars for Greater Manchester AHSN and for the NW coast area’s AHSN, the Innovation Agency, last year. Thanks to the LfE inspiration provided by the Plunketts, we’ve been contacted by a number of other hospitals. We’ve now delivered AI training to support other LfE initiatives in Glasgow Children’s Hospital, and for a group of hospitals in Sunderland and the North East, and from April 2018 we’ll be providing a programme to Nottingham University Hospitals NHS Trust. Please get in touch if you’d like to learn more about any of this work.